Latest neck art! Contact me if you’re interested in purchasing this show-stopper! I was at Eastern market in DC, and found a woman selling beads. I usually don’t like obviously dyed coral (Now that ox blood coral can’t be legally harvested anymore,most of the deep red is badly dyed), but this blue was so outrageously unnatural, I had to have it for some new pieces such as this one. 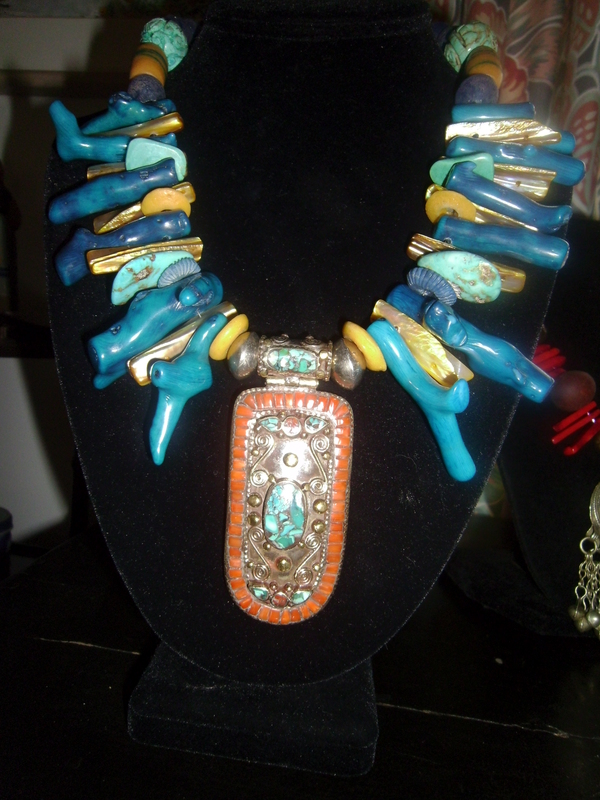 I’ve included turquoise, bamboo, African beads, and glass, and added a stunning Tibetan pendant to the mix. It’s definately a conversation piece!! 19inches Call or email for price.